Most of this material was graciously provided by Tim Jackson and modified by Paul Sayegh to include replacing the rubber washer with aluminum and the torque settings. 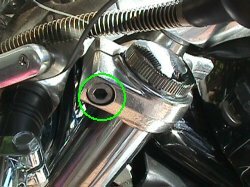 I doubt there's a Vmax owner with Web access who hasn't heard of the Furbur fix - a simple modification to the stock Vmax steering head assembly which adds a surprising amount of stability to the bike. The modification concerns the installation order and tightening torque of four specific components: Two nuts, a rubber washer and a securing clip. Unfortunately, in spite of looking for one, I haven't been able to find a Web site that shows how to do this mod in enough detail so that anyone with a basic set of tools can do it. This page is my attempt to provide those details so that just about any Max owner can safely carry out the Furbur fix, knowing exactly what it entails before they start. As with anything of this nature, you're completely on your own and I accept no responsibility for anything at all that happens as a result of you reading this page and trying out the mod. Consult your Yamaha dealer before doing this modification. Having said that, and having read about the really good results that most people have had by doing this mod, I would encourage you to do it if your Max suffers from steering instability at speed. There are many writings on the subject by people far more knowledgeable than I am so I won't even attempt to go into the dynamics of how and why the mod works. This page is here for the sole purpose of showing you how to do it. The whole operation must be performed on a level surface with the bike on its center stand. You should inspect your steering head bearings at this time and replace if needed. 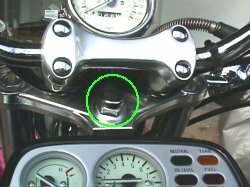 A slight pit can give your bike a "weave"
Remove the two headlight retaining screws located on the side of the headlight unit. 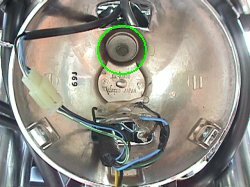 Completely remove the headlight by simply pulling off the connector on the back of the bulb and put it somewhere where it won't get smashed! Remove the headlight rear housing retaining bolt. 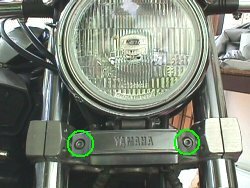 If you prefer, then instead of the above two steps, you can simply remove the two hex bolts in the Yamaha name plate below the headlight. This will allow the entire headlight assembly to be removed with the handlebars. 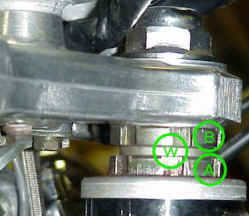 Loosen the two triple clamp pinch bolts (left side shown here) - there's no need to completely remove them. 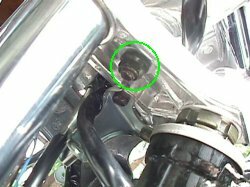 The hex head of the bolt may have a chromed plastic cap on it. Try and remove this by pressing some double-sided mirror mounting tape (or something similar) against it and then pulling it away. As a last resort a tiny screwdriver may be required to pry it off. Remove the steering head nut. A boxed end wrench works excellent. A metric is preferred but a 1 1/16 wrench works great. This is not necessary and you only need to do this if you did not have the wrench to remove the steering head nut (previous pic). 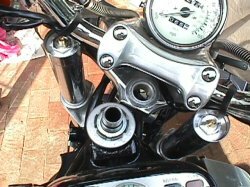 Remove the two retaining nuts located on the underside of the triple clamp (left nut shown in pic) and simply lift the handlebar assembly off the triple clamp. Lift the entire handlebar and triple clamp assembly upwards and off the steering shaft. 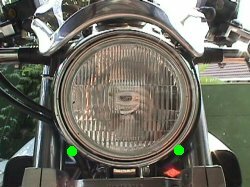 I found that if I moved it slightly forward after lifting, it rests naturally just in front of the forks, above the headlight housing as in this pic. I removed the chromed plastic valve covers from the fork tops before starting to prevent them from being damaged. Have a look at the top of the steering shaft. In order from bottom to top you have: First nut (A), rubber washer (B), second nut (C), securing clip (D). 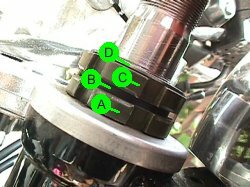 Remove the securing clip (D), the second nut (C) and the rubber washer (B), leaving only the first nut (A) in place. You really should inspect your bearings at this stage!! Remove nut (A) for total disassembly. 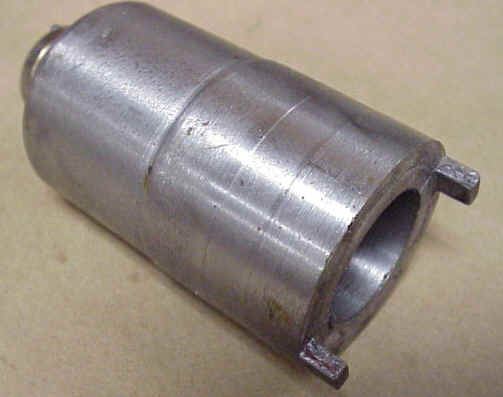 Tighten the first nut either with the proper Yamaha tool or make a tool like the picture below. A torque setting of 10 ft. lbs. usually works well. It is best to torque the nut to about 35 lbs. first, back off and retighten to the 10 ft. lb. setting. Disregard the manual torque settings. If no wrench or tool is available, sit at the back of the seat to get the front wheel off the ground. Check how freely the steering moves, allowing it to "fall" against each end stop. It will probably fall easily and "bounce" a couple of times off the end stop. tighten with a flat blade screwdriver and wooden mallet (as in this pic) until you can repeat the above test and get things tightened up just enough to eliminate the bounce. Now replace things in a different order. The first nut (A) is already in place and properly torqued. Next, insert an aluminum (or steel) washer (W) the same thickness as the rubber washer . Replace the second nut (B)and tighten firmly to about 40 ft. lbs. Make sure nut (A) does not turn!! 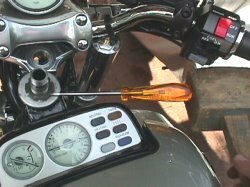 You can use a thin spanner wrench like the picture above to hold the bottom nut. The rubber washer and the securing clip are no longer used. Replace the triple clamp, replace and tighten the steering head nut and then tighten the pinch bolts, put back the headlight and anything else you removed or loosened. Hit the road and check it out! If your bike has a low speed "weave" you tightened the adjustment nut (A)too much.